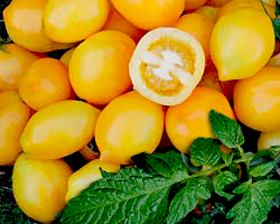 A truly trailing tomato.The plant produces good yields of yellow lemon shaped 80-120g tomatoes . These beautiful tomatoes are great for gourmet dishes and for making salsa. A heirloom variety. Height 150-200cm. Sow seeds in February-May 6mm deep and cover with a sprinkling of vermiculite or compost. Place in a propagator, or seal container in a polythene bag, at 18 - 21C until germination, which takes 7 - 10 days.